We meet Jared (Lucas Hedges) as he is on his way to the local ‘treatment’ centre. Yes, his loving parents have signed him up for some gay conversion therapy as a sign of their good parenting. He is being driven to the facility by his mother Nancy (played by Nicole Kidman, whose main focus in this film seems to be looking stern while balancing some type of small poodle on her head). Jared is taken into the facility where the work begins in earnest to brainwash him into being a lot less gay. Once there, we see the various techniques, largely involving making lists and asking him to ‘fake it ‘till they make it’, which I guess means pretend. The scenes of them spitting and arm wrestling must have ended up on the cutting room floor, although there is one impressive scene where they learn how to’ stand like a man’ (it involves triangles). The scenes of ‘therapy’ are interwoven with flash backs of his fairly boring student life and his time with his overbearing preacher/ father Russell Crowe (who really has let himself go a bit). This is a film from director Joel Edgerton who previously made ‘the Gift’ in 2015, which was a quirky thriller that worked on many levels. This film is a bit more self-righteous than its predecessor and tries to tackle a ‘serious issue’. The big names in the cast are largely under used, and there is an element of phoning it in from both Crowe and Kidman. You may recognise Lucas Hedges from Lady Bird where he played…. a young, confused gay man! Hollywood seems to have decided he has an earnest enough face to play all the young gay roles for the next few years. Flea of the Red Hot Chili Peppers does make an appearance as an ex-drug user/ gang member who found God. Anything that keeps him away from performing with the Chillies is good news as far as I’m concerned. The film follows on swiftly from the indie film ‘The Miseducation of Cameron Post‘ which was released last year. The main difference between the two films is that the indie film made the big decision of giving the young people personalities. 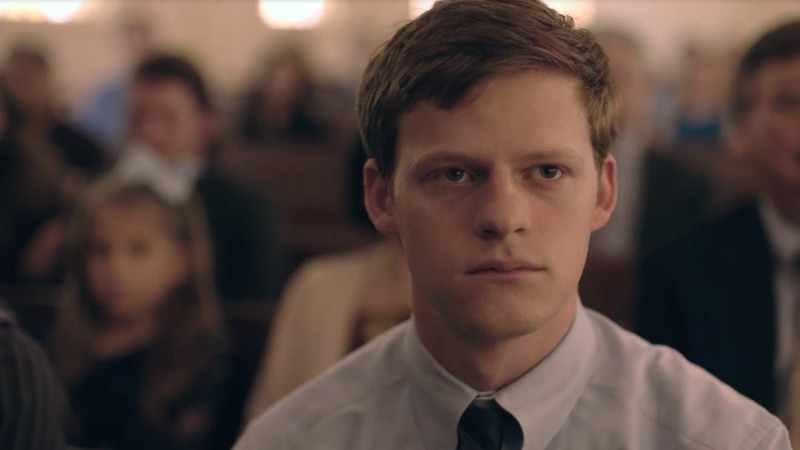 Boy Erased decided to give them furrowed brows and intense thousand yard stares instead. While Cameron Post most certainly has its flaws, if you must see a film about an anti-gay training camp (and I’m really not sure you do) it’s definitely Ms. Post. If you do watch Boy Erased I’d recommend you do it at home where it is much easier to play with your phone and ignore what is happening on screen.